Kelly Wun, a fourth-year medical student, dedicated a research year to completing the project under the mentorship of Karen Ho, MD, assistant professor of Surgery in the Division of Vascular Surgery. A Northwestern Medicine study has demonstrated for the first time the role the microbiome plays in the development of restenosis, a condition in which arteries re-close after a previous intervention to clear blockage. “These results are important because they demonstrate that microbiota can affect blood vessels, which are normally not directly in contact with microbiota,” explained principal investigator Karen Ho, MD, assistant professor of Surgery in the Division of Vascular Surgery, and a member of the Robert H. Lurie Comprehensive Cancer Center of Northwestern University. Kelly Wun, a fourth-year medical student, was the first author of the study, which was published in the journal PLOS ONE. Vascular procedures, such as balloon angioplasty and stenting, are used to treat atherosclerosis by opening up clogged blood vessels. However, an inflammatory response to the arterial “injury” can result in a form of scarring called neointimal hyperplasia, which is a major cause of restenosis, the gradual re-narrowing of the vessels. The incidence of restenosis in patients within one year can be as high as 50 percent, and is associated with worse outcomes. 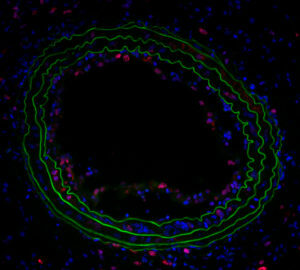 Immunofluorescence of a carotid artery cross section stained with an antibody for Ki67, a marker of cell proliferation (red). Blue represents cell nuclei. Green represents elastin. Increasingly, research is uncovering the role the gut microbiome — the microorganisms that live in the human gastrointestinal tract — plays in a variety of processes, including inflammation and wound healing. However, a direct link between microbiota and the development of restenosis after vascular procedures had previously not been established. In the current study, the Northwestern team used germ-free mice, which are born and raised in completely sterile conditions, and thus lack all microbiota. The scientists then compared the arterial injury response in the germ-free mice with a group of conventional mice. They discovered that the germ-free mice developed significantly less neointimal hyperplasia than the conventionally raised mice — illustrating the influence of microbiota on the arterial injury response. By examining inflammatory markers, they also found marked differences in local and systemic inflammatory responses to arterial injury between the two groups of mice. Beyond providing a deeper understanding of the pathophysiology of neointimal hyperplasia, the findings also suggest that modulating microbiota may offer a novel approach to preventing restenosis in patients. In ongoing research, the Ho Laboratory is continuing to investigate how microbiota can impact inflammatory pathways after arterial injury. 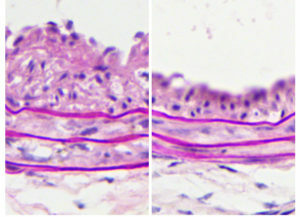 Photomicrograph image of a carotid artery from a conventionally-raised (left) and germ-free (right) mouse 1 month after arterial injury. There is more neointimal hyperplasia development in the conventionally-raised than in the germ-free mouse, which thickens the wall and decreases the cross-sectional area of the vessel lumen. 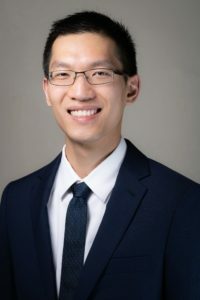 Wun dedicated a year between his third and fourth years of medical school to focus on this research, which began as his Area of Scholarly Concentration (AOSC) thesis. The study was supported by the National Heart, Lung, and Blood Institute T32HL094293 and K08HL130601; National Institute of Diabetes and Digestive Diseases T32DK007074, R01DK097268, P30DK42086, R56DK102872 and K01DK111785; American College of Surgeons; Society for Vascular Surgery; Lanterman Vascular Surgery Student Award; Vascular Cures; and Abbott Fund.